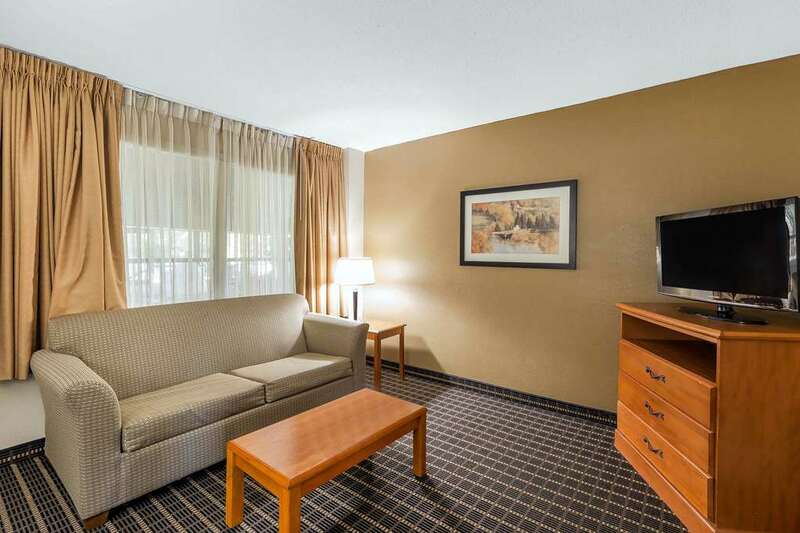 The Quality Inn and Suites Sevierville - Pigeon Forge hotel in Sevierville, TN gives you real value with peace of mind. Our pet-friendly hotel is near Sevierville Events Center, Tanger Outlet Mall, Dollywood, LeConte Convention Center and the Great Smoky Mountains. Enjoy our amenities that include free hot breakfast, free WiFi, free weekday newspaper, free coffee, an indoor heated pool, a seasonal outdoor pool and a hot tub, newsstand, guest laundry facility and fax services. Each inviting guest room features a TV, hair dryer, coffee maker, microwave, refrigerator, iron and ironing board. Select rooms offer a sofa sleeper. Also, earn rewards including free nights and gift cards with our Choice Privileges Rewards program. Pet accommodations - Dogs Only 20.00 USD per night per pet - not included in room fees. Pet limit 1 pet per room, 25 pounds and under. Pets are only allowed in rooms listed as Pet Friendly. Please contact the hotel for Pet Room Availability.